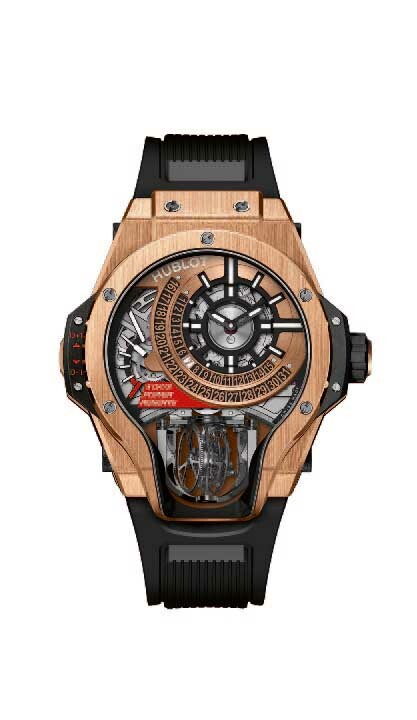 With its new Manufacture Piece (MP), Hublot is pushing back the boundaries in terms of multi-axis tourbillons. The MP-09 Tourbillon Bi-Axis is thus the result of a powerful idea: to provide a maximum of visibility on the tourbillon—and its fascinating double rotation—by designing a fine watchmaking movement devoted to this objective, and then creating an original case that highlights the 100% manufacture calibre. Here, the function defines the form. This perfectly reflects the prevailing philosophy in the design of all of Hublot’s “MPs”, namely to develop an exclusive movement dedicated to a function and to design specific external parts to highlight this motor. The MP-09 corresponds in every way to this concept. Let’s remember that this capacity to design and produce an interdependent movement and case is the signature of a truly integrated manufacture. The Hublot MP-09 Tourbillon Bi-Axis watch beats to the rhythm of the fine watchmaking calibre HUB9009.H1.RA, a mechanical movement with self-winding featuring a 5-day power reserve. It also features a bi-axial tourbillon that undertakes a complete rotation per minute for the first axis and a rotation every 30 seconds for the second. This means that the dynamic movement—immediately perceptible—of this double tourbillon frame has an appearance that is as fascinating as it is fun. In order to offer the greatest possible visibility to the watch’s beating heart, the watchmakers at the Hublot manufacture have created an all-new MP-09 design for the movement and for the case. 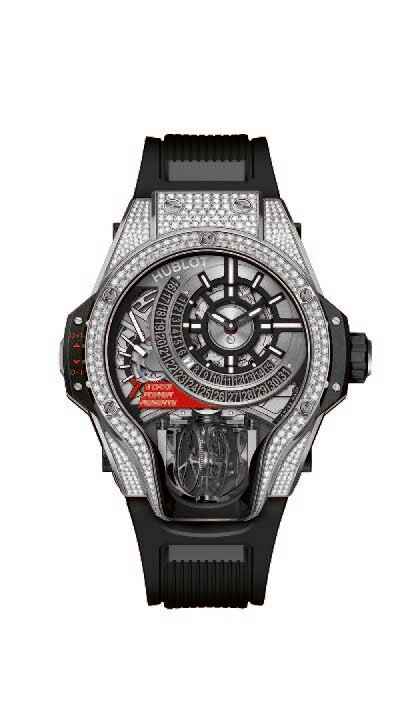 Thanks to its position at 6 o’clock and a large opening that covers a very complex 3-sided sapphire glass, the gaze of the wearer will literally plunge onto the frantic travel of this bi-axial tourbillon, which overcomes the effects of gravity in a much more subtle manner than an ordinary tourbillon. Besides this technical specific feature, the MP-09 Tourbillon Bi-Axis also stands out because of its innovative date corrector, which is as ingenious as it is practical. Via a simple winding movement of the lever up or down, the date moves respectively forward or back by a day. The construction of the dial over several levels—alternating black, white and red—also enhances the elegant character of the MP-09. Around the hours and minutes display, the date indication—instantaneous—is arranged in tiers in two half-circles on two distinct levels, while the 5-day power reserve is displayed in a gauge at 9 o’clock. Incorporating many codes from Hublot’s DNA, the 49-mm diameter case, water resistant to 30 metres, comes in two distinct versions: in titanium or in King Gold (bezel / upper and lower plates / back). Like all exceptional watches combining cutting edge technology and complex construction, the Hublot MP-09 Tourbillon Bi-Axis model is subject to production that is, by definition, limited. The MP-09 in titanium will be a limited edition of 50, whereas the version in King Gold is limited to 20. In unveiling its MP-09 Tourbillon Bi-Axis, Hublot once again demonstrates its capacity to design clearly unique and distinctive watches. Watches that clearly bear Hublot’s signature with a strong character that demonstrate an absolute mastery in all areas of fine watchmaking.